We ordered seeds from eden seeds online. They have a great variety and we wanted to get more than the local seedlings offered and also support the diverse amount of seeds in the world. It was very exciting to receive the seeds in the mail. You can see the little seed envelopes in the picture above. We bought everything we eat, the dream being to feed ourselves. Broccoli, marigolds, tomotoes, roma tomatoes, corn, cucumber, spinach, capsicum, coriander, passion fruit, lettece, basil. It has gone relatively well but our advice to first time gardeners would be not to overstretch. Find what works well in your local area and you enjoy eating. Vines always work well, zucchini, cucumber, pumpkin. Next year we plan to do just tomatoes, zucchini, beans and corn. We will get these right, producing good quantities and then expand gradually. 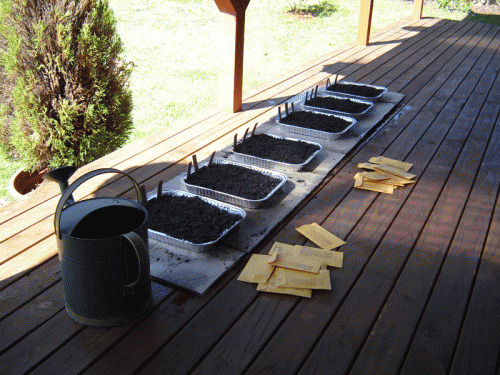 For planter trays we used BBQ aluminum trays with holes punched in the bottom. These were cheap but for some seedlings they were not deep enough, corn for instance. The seed raising mix is essential, or make you own, it has to be loose and easy for the root to develop. Heat and water are the main triggers for germination. Soil and growth come later. I would advise starting seeds way before you need them, so you have strong seedlings ready to go. Next year we might try at the end of winter to simulate the conditions needed for germination to get them going earlier. Maybe a hot water bottle under the tray or something fancier. Our beans were the strongest performers in germination and seedling growth, so if you have kids you want to interest in garden these would be good, large seeds, quick growth once the conditions for germination have been met. Corn also grew quick and were quite hardy. Spacing of seeds is important too, I threw a lot in, wanting a lot of plants or trying to account for non germination. It is better to sprinkle a few evenly spaced so they have strong independent roots. Get more seed trays if you want more plants, but allows the seeds you have space to grow to decent seedlings. Preparing the soil. Being a first timer, I concentrated on the seedlings and making the garden look nice. Soil is very important so while your seedlings are getting established spend some time turning in manure and blood and bone. I just dug it over and mulched it and put the seedlings in. I then tried to put some compost in and it was difficult at this stage working around the young plants, better to dig everything into the soil at the start. Anyway, above is a picture of what we started with. Now magically with no weeds. I did this with a shovel and fork. Cut out shovel size squares of turf and turned them upside down to die. Later returning to get the turf and weeds out of the soil with a fork. It was hard work and we had considered a rotary how but this was cheaper and I enjoyed the sense of achievement. 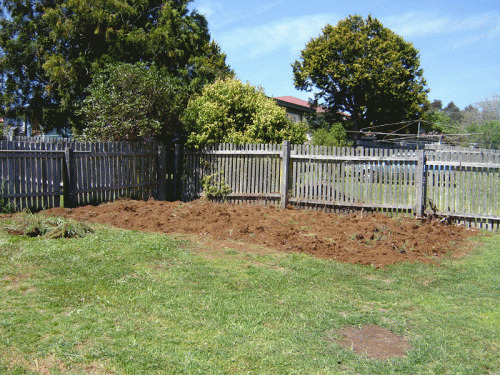 Then I cut paths and mounded the soil into sort of raised beds. At this point we watered in some blood and bone but this stage I would expand apon next year. 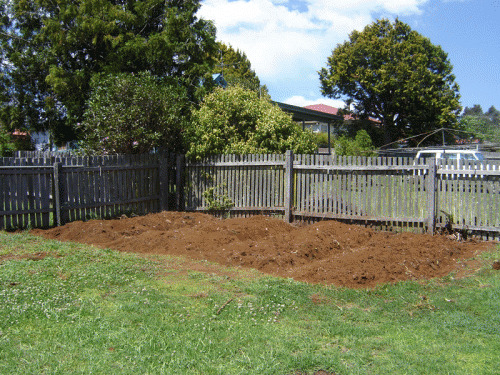 Taking our time, letting the soil process all the manure and compost we give it. Next we used old shade cloth to simulate a raised bed. We would have liked timber sides because all the tv shows have them. But now I think there is no need for them, I would just raise the soil a bit to loosen the soil and incorporate compost and lighter materials for the plants roots. If I were to raise a bed I would do it right to waist height so you don't have to bend. Sugar cane then as mulch, we found this worked great to suppress weeds and keep water in the soil. Hay had seeds in it that created a weed nightmare. The paths are covered in sawdust to inhibit snails and slugs. This worked well, except in the wet as the saw dust become flat and easy to move across for the snails. We then used a small amount of snail bait. The other tactic that helped was to put up a shade cloth barrier along the fence to reduce access. 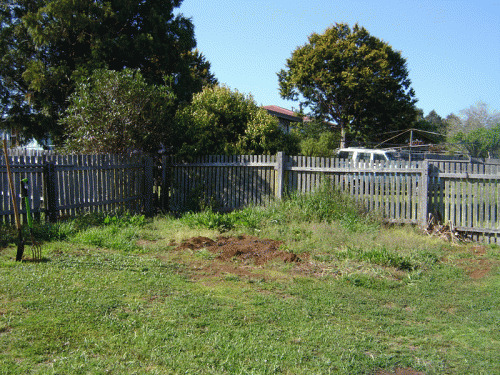 We also went around our property removing snail habitats such a rubble and other cool wet shady areas. This is our garden actually growing stuff. I have added two more beds. 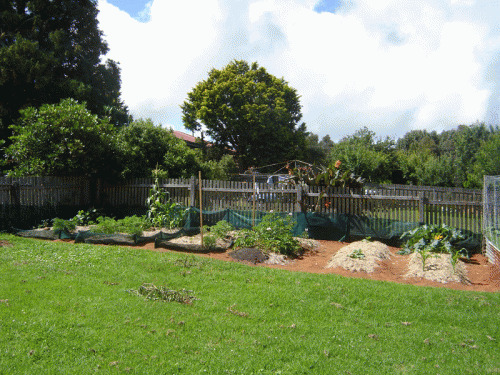 In this shot you can see from the top bed, beans, corn, carrot, capsicum, tomatoes, potatoes, zucchini and corn. Here we have a bit more growth. We had a problem with birds, satin bowerbirds we think, just pecking and eating leaves. The beans were hit first then the tomatoes. We have hung up cds to reflect light and plastic shopping bags to make noise to startle them. May have to consider some way of covering the garden. At this stage we have eaten beans, carrot, capsicum, potatoes and zucchini from our garden. It is getting lush and we are seeing veges grow each day. We are always learning and having a great time at it. 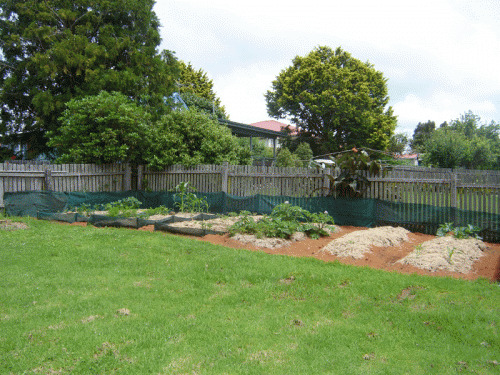 ongoing adventures - bird netting the vege patch. have you read the book 'One Magic Square' by Lolo Houbein? 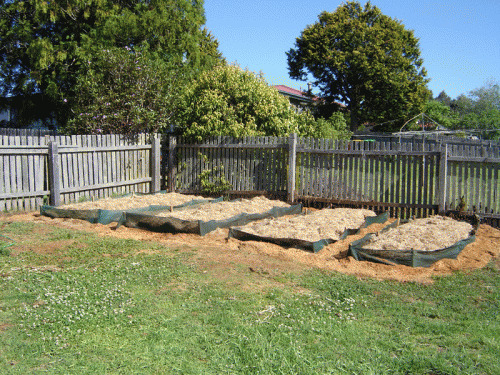 all about easy to do self sustainable gardening - looks like you would enjoy it. Changed the way i looked at gardening forever.